At work: Koire welds under the guidance of Wamawungo. Photo by Daudi Nana. From the age of five, Ivan Koire was committed to a life of hard work. Confined at home unless he was going to fetch water or to the garden to dig, his mother Gertrude Mugala openly acknowledges the life she has decided for her teenage son. “I didn’t take him to school because he is dumb and deaf,” says the mother from Lyama Sub County in Budaka district. “So we just kept him at home to help us with domestic work.” She adds. For most people in Budaka district, the boy was seen as abnormal and a curse from God. This type of life typifies the misery faced by hundreds of deaf and dumb children in many villages of Uganda where the tradition does not give them an opportunity to be heard. According to Mr Oleja Enyogu the assistant project manager at Cheshire services, Uganda, an local NGO that is involved in looking for the deaf children from the villages, enroll them in schools to mold them into self-reliant individuals hard of hearing, say globally 10% of the world’s population is deaf and that Uganda out of the 33 million people about 3.3 million people are deaf. “Of this number 60% are born with hearing problems while others contract them through diseases like mumps, measles, whooping cough and meningitis,” says Mr Enyogu. Mr Enyogu adds that Budaka with an estimated population of 221,500 according to the 2002 national census has approximately 28 % of the population deaf, the highest in Uganda. Ms Mugala is a single mother of six children, who struggles to get by. She says whenever Koire got sick; she would go through the difficulty of understanding his gestures. She also says she occasionally left him at home sick because she could not understand him well and that at times she ignored his sickness until the temperature was so high that she took him for treatment. “I carried him back home, kept him in the house as I went to the garden,” Ms Mugala said. Assistant Commissioner of the youth and Children affairs James Kabogoza says that children with disability especially those who are dumb and deaf face exclusion from society and stigmatization in most tribes in Uganda. Mr Kabogoza adds that the dumb and deaf children have been denied the opportunity to go to school, they are abused and often relegated to casual laboring and that in certain homes they are rejected, treated as curses. “And this goes on even at hospitals, schools and they never access justice,” said Mr Kabogoza. When Koire was 14 years old, he wanted to go out and do something to earn a living. He would occasionally sneak out to find casual labour jobs, as his family prevented him from leaving the home. Mr Koire was in the village as usual when he was approached by an NGO looking to enroll disabled children in schools for skills development and that he showed interest. 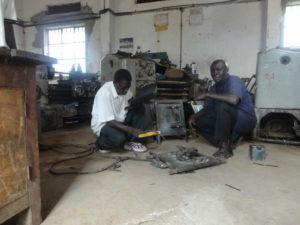 Mr Koire adds that upon invitation at Cheshire Services, Uganda Livelihood resource centre at Budaka, he started training in sign language, business skills, how to count money and how to save before later he was enrolled for skills training at Mbale community polytechnic for welding lessons. Koire’s teacher Michael Wamaungo says he is constantly impressed with the handling of welding and metal fabrication from his students. “I have discovered that the dumb and deaf are not good at theories because of difficulty in communicating but in practical skills they are so good, very attentive and pick very fast. So far we have made doors, windows, charcoal stoves and we have also done various fabrications and joinery here,” said Mr Wamaungo. When Mr Koire went home in April for holidays, Ms Mugala discovered there was a change in her child’s life, “He came with charcoal stoves he has made at school, he tries to communicate, can count money, I am impressed, this is great,” says Ms Mugala. Although government has set up Wakiso School for the deaf, the only secondary school in Uganda little has been done at lower levels in primary where the basic sign language is taught. “Most primary schools are owned by NGOs but most importantly is that government spends money every financial year to cater for the disabled children at all districts and because many districts don’t know the statistics of the deaf and dumb in the districts, have negative attitude towards such children, money is usually squandered and nothing is done,” said Mr Enyogu. Mr Jackson Mbuusi an audiologist attached to Uganda school for the deaf says deaf and dumb children’s talents in skills compensate for their academic weaknesses’ and thinks that government should consider helping such children to join practical skills. Mr Mbusi says that there is great need to incorporate trade and skills training for the deaf and dumb students to help them acquire skills necessary for survival in society. Mr Koire was lucky to have been sponsored by a local NGO – Cheshire Services Uganda is working in disability and inclusive development where people with disabilities are trained in modern farming methods, tailoring, carpentry, and motor repairs among others. Mr Enyogu says that the approach at Cheshire is to provide a holistic approach to people with disabilities and by linking them to employment opportunities. Mr Enyogu says that like any other Ugandans, the skills, experience and educational qualifications of the deaf and dumb are widely varied, but they tend to be an under-utilized talent pool. “If Companies look beyond someone’s disability and seize the potential of everyone who wants to work for them, they could benefit immensely,” he says. Under the disability programme in Cheshire services Uganda, a total of 68 disabled children have been enrolled in schools; Three are at Nile vocational institute in Jinja, 46 are in Mbale municipal community polytechnic, 12 are in various artisans for skills within Mbale, 4 are doing graphic designing and printing in Kampala and 3 are in Cheshire services Uganda resource centre in Budaka training in hair dressing while 4 are training with master trainers to make sweaters and table cloths from various villages in Budaka district. Cheshire Services Uganda has since its establishment promoted rights and Education of the PWDs in Budaka, Buikwe, Butiru[Manafwa], Katalemwa, Nkokonjeru and Soroti.